Clinic Synopsis: Using 9x13 laminated rhythm cards, I have used several activities over the years that help students practice and improve their rhythm reading skills in large group settings. Directed to beginning and second year instrumental groups, this S.H.O.P. Talk will demonstrate the different activities. 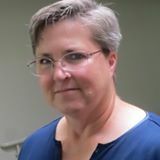 Clinician Biographical Information After receiving a BA degree in Music Education from Utah State University (1987), Rhonda Rhodes taught instrumental music in the Washington County School District in Southern Utah for 25 years. Concurrently, she taught Woodwind courses and ensembles at Dixie State University as an adjunct and part-time instructor. She taught for the 2013-14 academic year at Utah State University-Eastern in Price, Utah, directing the band and choir programs. Beginning in August 2014, she became full-time faculty at Dixie State University, teaching courses in Music Education, Woodwind Study, Music Theory and Ear Training, Woodwind Ensembles and Private Saxophone lessons. Rhonda received a MM Degree in Instrumental Conducting from Northern Arizona University (2000) and a DMA in Music Education from Boston University (2017). Specializing in woodwind doubling, Rhonda plays saxophone, oboe, English horn, clarinet and flute. She studied with Dr. Larry Smith (Saxophone & Jazz, Utah State University), Dr. Max Dalby (Conducting & Music Education, Utah State University), Dr. Patricia Hoy (Conducting, Northern Arizona University), Dr. Rebecca Scarnati (Oboe, Northern Arizona University), She has played woodwinds for the music theater productions at Tuacahn Amphitheater in Ivins, Utah since 2000, and has played oboe in the Southwest Symphony Orchestra in St. George, Utah since 1989. Rhonda is an active adjudicator and clinician in Utah. Highly active in the Utah Music Educators Association (UMEA), she served as Jazz Vice President (1999-2003), Business Manager (2004-2014) and currently serves as President. She is faculty advisor to the Dixie State University Collegiate Chapter of the National Association for Music Education (NAfME).